The U.S. military has bases located in or adjacent to cities across the nation and, as neighbors, the security and operations of these bases are interdependent on the resilience of their home city. Military installations and city neighbors face common threats from extreme weather, sea level rise and flooding, infrastructure failure, blackouts, terrorism, drought, and extreme heat. As a result, these neighbors also share common interests in enhancing the resilience of infrastructure systems to ensure the predictability and availability of services, such as water, wastewater, electricity and transport. These services are necessary to fulfilling military operational missions and in protecting the health, safety and well-being of military personnel and their families, who often reside in the surrounding communities. At the same time, many cities lack the resources — human, financial and technical — to modernize their infrastructure and ensure its resilience. Recognizing the interdependencies with surrounding cities, the military could be a partner to provide funding, technical support and resources to help cities enhance the resilience of infrastructure systems supporting the operational missions of both the city and the base. Military bases should partner with the cities to enhance the resilience of infrastructure systems on which they both depend. The Department of Defense (DOD) should work with cities to enhance the resilience of interdependent systems, including systems that protect the health, safety and well-being of military personnel and city residents, that support military installations and the infrastructure systems that protect military installations, and provide them with critical services such as energy and water. The proposed DOD-City Infrastructure Resilience Partnership would build upon the DOD’s Readiness and Environmental Protection Integration (REPI) program, which enables the military to work with governments and nonprofits to enhance military readiness by multiple means, including purchasing and placing conservation requirements on land adjacent to bases.50 The DOD-City Infrastructure Partnership would coordinate infrastructure modernization and resilience improvement between military bases and their neighboring jurisdictions, focusing on mutually beneficial investments that enhance preparedness and reduce losses from natural disasters. Based on local conditions, needs and mutual benefits, projects supported through the partnership could include cyber security software, energy redundancy through microgrids, transportation alternatives, water supply and quality enhancements, and public health innovations. Assess local threats to infrastructure, building off existing federal and local resilience plans. Access funding for the design, construction or rehabilitation of infrastructure to enhance its resilience, including through Department of Defense programs that fund community participation and coordination efforts. Congress should authorize and appropriately fund the new DOD-City Infrastructure Resilience Partnership under the National Defense Authorization Act and the appropriations committee should fully fund the critical infrastructure that both military installations and surrounding jurisdictions rely on. 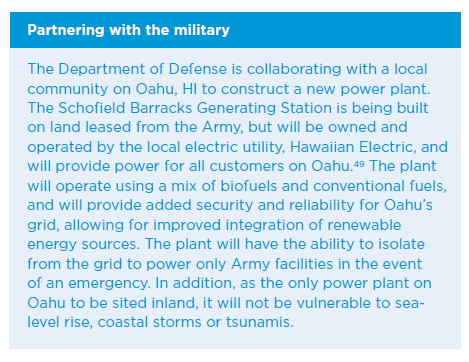 The Department of Defense, including the U.S. Army Corps of Engineers, should invite resilience dialogues with neighboring communities to determine shared goals and potential collaborative projects. 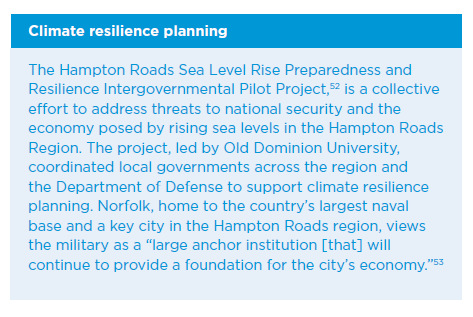 The Department of Homeland Security should implement its 2015–2019 Strategic Plan “Mission 5: Strengthen National Preparedness and Resilience,”51 by providing funding and other support for DOD-City Resilient Infrastructure Partnership projects.